I've been looking forward to sitting down to this all week and I fear that this is the only time I'll be able write anything until the weekend. This is the latest album from one-man Canadian death/black metal band Haiduk. Prior to the release of "Exomancer", Haiduk released a demo and two full-lengths; "Spellbook" and "Demonicon" respectively since forming in 2009. One thing that separates Haiduk from many of the other solo-projects is that he plays live. Haiduk’s death metal is certainly brooding on album opener Death Portent and the programmed drums do nothing to change that. It’s also technical and grinding, which is fine with me. The vocals are delivered with a low rasping growl while the music contains a space-age feel. Aside from that, Haiduk adds layers of black metal into the mix and Unsummon provides a glimpse of that, especially in the instrumentation. It’s not “kvlt” but that’s no problem because it’s there to add atmosphere and it does that well. 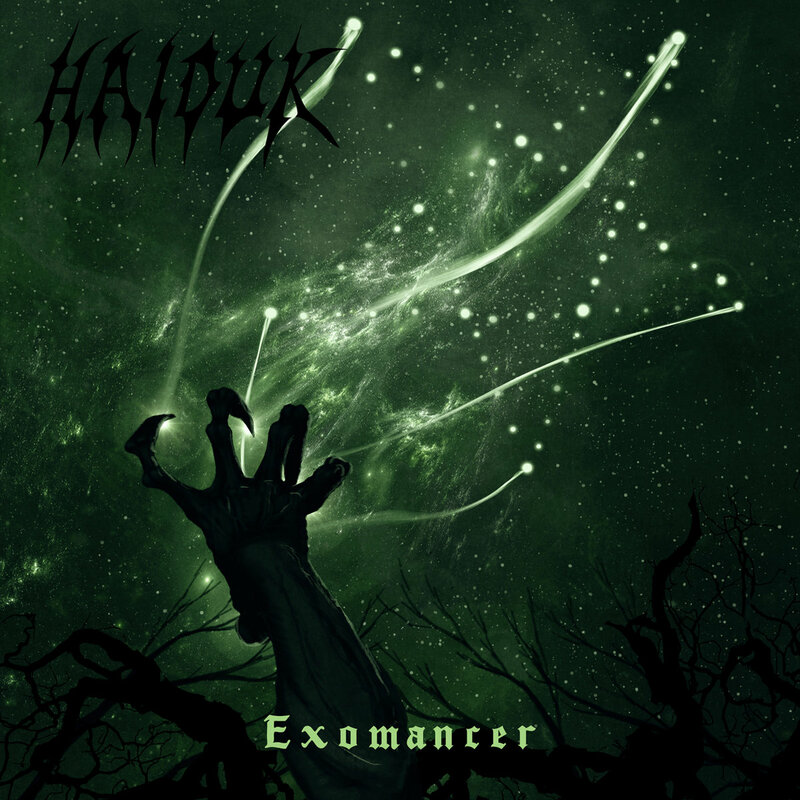 The guitar-work on “Exomancer” especially stands out due to it’s proficiency and technicality, as demonstrated on Evil Art, where both the lead and rhythm guitar layers amongst this mostly instrumental song make it sound like Haiduk is more than a solo-project. In fact, Haiduk rarely uses vocals for any great length of time, allowing the instrumentation to do all of the work, as demonstrated on Subverse. The songs are not overly long either, which means the momentum is kept strong throughout. The grinding percussive passages and introspective, off-kilter tempos make Icevoid Nemesis an exciting listen. With the whispered growls nestling within the mix, there’s plenty of room for the full gamut to be enjoyed. On Doom Seer you get a proper slab of chunky death metal. Its trance inducing at times, as the riffs repeat. There are elements of some of death metal’s biggest bands nestling within the music and Pulsar reminds me of the likes of Deicide and even Fear Factory (I know they’re not technically a death metal band but…). It again shows the skill that Haiduk possesses musically and writing-wise. The urgency is very real on Blood Ripple, where the pulsating rhythms sound more like they belong in a gabba song than a death metal one. That’s not a criticism by the way, rather a nod to how pumped-up it’ll make you feel. Once Flesh is just as fun, though definitely more of a straight-forward death metal song this time. That being said, you cannot call this traditional so purists may find it hard to swallow. Album closer Crypternity contains a jarring intro riff that’s atonal. It carries on throughout the song in a sporadic fashion contributing to quite an unnerving end. Haiduk has written, recording and produced an epic album in “Exomancer”. The sound quality is great and it has character, which is difficult to find. The sole creator Luka is really talented and the strength he has to forge his own path in the death metal-verse is obvious to see. Good work! The cd version and Haiduk's previous releases are also available here - https://haiduk.bigcartel.com.